Gabriela Ungureanu is both thoughtful and enthusiastic. 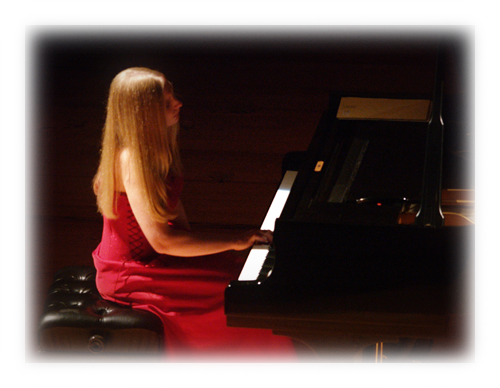 She is thoughtful as in the vast repertoire she is now embracing, she gladly approaches not so well known composers and at the same time she takes up the challenge of playing the whole range of Beethoven's sonatas among other famous pieces. She is always seeking the deep signification within the works and respecting each composer's specificity in order to serve their message as faithfully as possible. She is enthusiastic as she is gifted with a remarkable energy that she devotes to music. Her strong presence on stage blends with a great complicity with her partners in chamber music.She feels each concert as a celebration and a time of joy that she shares with the musicians and the audience. Her vast sound range from orchestral vigour to intimate delicacy is emphasized by this propensity of offering.Her generosity breaks through to the very depth of each sound.